(MissionNewswire) Youth in Salesian programs around the globe are committing to making the world a cleaner and healthier place to live. In 2016, the Salesian Rector Major, Father Ángel Fernández Artime, signed an inter-religious declaration on climate change. In response, Salesian missionaries in India established the Don Bosco Green Alliance, an international collective of young people from Don Bosco institutions and organizations that contributes to global environmental action, thought and policy. The Don Bosco Green Alliance’s priorities are combating pollution, reducing global warming and eliminating disposable plastics. In each of these areas, the Alliance aims to partner with ongoing global campaigns promoted by the United Nations Environment Program (UN Environment) or other international organizations. 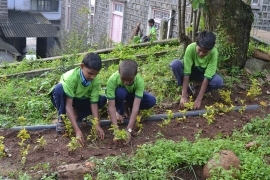 Members of the Alliance have undertaken such initiatives as environmental education to increase green areas and planting trees, the reduction of the use of non-degradable materials, promotion of organic agriculture and home gardens, preservation and conservation of water and increasing the use of renewable energy sources. In the Salesian Tiruchy Province, Eco Clubs have also been founded. These clubs, which consist of 20-25 youth and are coordinated by an adult educator, meet once a month for training on environmental issues. The clubs also plan ecological activities and instill in youth an aptitude for eco-sustainable behavior, encouraging them to always evaluate the long-term consequences of their actions. In 2017 alone, Eco Clubs planted 5,350 trees. The Don Bosco Green Alliance has also launched the Green Campus Campaign, inviting all members of the Alliance to strive towards achieving ten benchmarks. These benchmarks include starting a green campus committee, zero litter, waste management, energy efficiency, water conservation, sustainable travel, avoiding plastic pollution, healthy food, enriched biodiversity and green procurement.